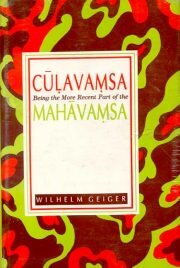 Culavamsa or `The Little Chronicle`, a thirteenth century work composed by Bhikkhu Dhammakitti in Pali, is a supplement to a much earlier work named Mahavamsa. These are the main sources of the political and religious history of Sri Lanka, the history of King Parakkamabahu being the real kernel. The main subject of the Culavamsa, especially of the first part, Parakkamabahu was the son of the eldest of the three brothers Manabharana, Kittisirimegha and Sirivallabha who ruled over Dakkhinadesa and Rohana in opposition to Vikkamabahu. The present volume is a reprint of the English translation from the German rendering of the work by Wilhelm Geiger in two parts bound in one.